Looking for science songs with really solid instructional content? 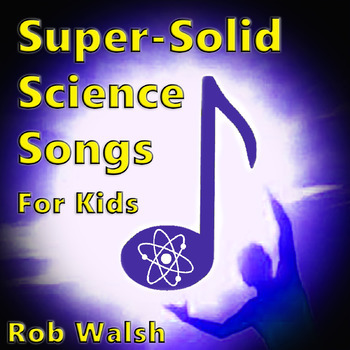 As a science teacher, so was I, but I was frustrated by what I found out there: Most of the science songs I heard for kids would mention only one or two facts, while spending the majority of the song singing about things that are entertaining but not particularly instructive. I was unhappy with that. If I was going to dedicate class time to science songs, I wanted to make sure they packed a lot of instruction into the lyrics, to maximize the learning benefits. The whole point, it seemed to me, was to help kids grasp science concepts through a different medium. I didn't see any reason why science songs couldn't be fun for kids and yet chock full of information from beginning to end. And so I wrote my own collection of science songs to keep kids amused and entertained while teaching them essential science concepts. In this ZIP file, you'll receive the song in mp3 format, the lyrics, the chords (in case you'd like to perform them yourself for your students), and a cloze activity for each song. 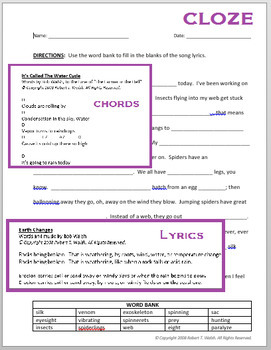 The cloze worksheet includes the lyrics of the song with key words left blank. A word bank at the bottom helps students fill in the answers. I often have my students listen to a song first, then fill out the cloze worksheets while the music plays in the background. I have also used it as a quiz to see how much they remember without the music playing. This has been an enormously successful venture in my classroom. The kids love it, and they learn a great deal in a really fun way. Enjoy!